Happy National Korean-American Day! We’re celebrating today by sharing some of our most cherished Korean chefs who have elevated Korean food as we know it. As our global cultures collide, Korean food is making a huge impression on the American culinary landscape. Today, you can find ingredients such as sesame oil, kimchi, and gochujang in many restaurants. 1. Described by the New York Times as the “Youtube’s Korean Julia Child”, Emily Kim akaMaangchi is most notable for her Youtube videos that show step-by-step cooking demonstrations on preparing delectable Korean dishes. Her wholesome recipes provide a sense of nostalgia and comfort for viewers who grew up eating Korean food. You can watch her in Season 1 on the television series, Lucky Chow withDanielle Chang. 2. Deuki Hong is an author, chef, and owner of San Francisco’s Sunday Bird. He caught national attention for offering a low-key, inexpensive, and incredibly delicious serving of fried chicken to city’s food scene. His rendition of the dish is geared towards the more classic Southern style- but hey, we’re not complaining! 3. Chef Hooni Kim hails as a leader that revolutionized Korean cuisine for American palates. Owner of both Hanjan and Danji in New York City, Chef Kim serves up classic Korean fare as well as bold, street market-type dishes such as Spicy Rice Cake with soft boiled egg, Tangy Spicy Fried Wings and their amazing Handmade Dumplings. 4. Winner of Season 10’s Top Chef, Kristen Kish brings her culinary background to life by creating delicious comfort foods that resemble her childhood. At her restaurant Arlo Grey in Austin, Texas, Chef Kish cooks up mouth-watering burgers and other delicious fare such as Crispy Rice with crab and bacon, Vegetable Rigatoni and Braised Pork Osso Buco. She has also hosted an inspiring LUCKYRICE cooking demo in NY. You can find her cookbook here. 5. 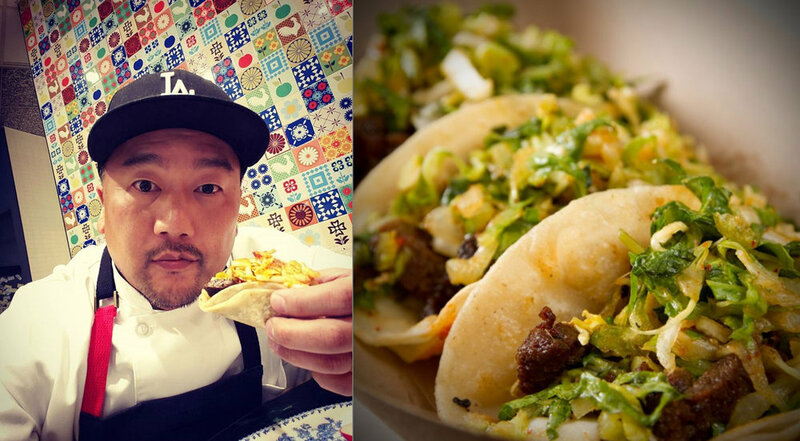 Roy Choi, creator of the LA gourmet Korean taco truck, Kogi Korean BBQ, is the perfect example as a pioneer for modern cuisine. Well-known for his push towards the gourmet food truck movement AND Korean-Mexican fusions, Chef Choi is proving that America is one giant delicious melting pot. 6. Danny Bowien chef and co-founder of Mission Chinese Food, is based in New York and San Francisco. Originally from South Korea, Bowien moved to Oklahoma where he decided to start cooking mouth-watering (and firing) Sichuanese food. He’s been featured on the television series TheMind of a Chef and winner of the 2013 James Beard Award and Pesto World Championship in 2008. 7. Partner and dear friend, Sang Yoon is the chef and owner of Father’s Office, Lukshon and Two Birds One Stone. Beginning his career in the world of fine-dining, Yoon has since moved towards the gastropub movement. Both the TODAY Show and Esquire magazine have hailed his “Office Burger” as the best burger in the country. Now that’s something you can go home to tell your mama! 8. Owner Sarah H Lee and Chef Wonil Lee opened Kimbap Lab in Brooklyn which uses healthy, locally-sourced and gluten-free ingredients to offer a new kind of Korean comfort food. Traditionally, kimbap is not served with sauces, but Kimbap Lab is the first ever to offer a line of dipping sauces and pickles that pair perfectly along with the dishes. Their meals offer all the pleasure, flavor, and satisfaction, minus the guilt. So you never have to feel bad going for seconds (or thirds or fourths...)! Their kimbap is always popular at our LUCKYRICE Feast. 9. Dubbed as the “Korean Food Ambassador”, Cathlyn Choi is the host of the PBS show and author of Cathlyn’s Korean Kitchen. She curates cultural and culinary events in southern California to showcase Korean food to locals and public media and has developed over a thousand different recipes! 10. Last, but definitely not least, is Chef/Owner of the renowned Momofuku restaurant group, David Chang. Chef Chang is one of the most well-known Korean-American chef in the biz, and rightfully so. He is the author of Momofuku, creator of the Netflix original series, Ugly Delicious and all-around culinary badass. He has also hosted the LUCKYRICE Inaugural Night Market and we are extremely proud to have him part of our esteemed Culinary Council. Be sure to check out these incredibly amazing Korean American chefs to see what we’re really talking about!